Think back to when you were a kid and heard the music of an ice cream truck. You’d rush to get change before it was too late. As adults, coming across our favorite local food truck gives us that similar feeling of excitement. It’s a small but pleasant surprise that can brighten up an ordinary day. But that unexpected surprise creates logistical issues for the food truck owners, who are banking on customers finding them easily. A new app, NOMAD, co-founded by LSU alumna Ellen Gugenberger and her husband Walter Gugenberger, aims to help them. NOMAD uses location services from participating food trucks to show their real-time location within a five-minute window. From there, users can view nearby food truck profiles and their menus, including daily specials and what items have sold out that day. Then, for a 99-cent fee, users can order and pre-pay through the app. 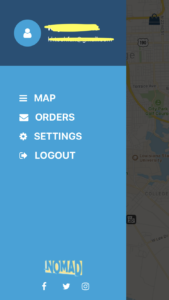 Users are notified when the order is ready, allowing them to skip braving the elements and the line at the food truck. The app launched earlier this month with several New Orleans food trucks hopping on board. Ellen Gugenberger says she hopes to start getting Baton Rouge trucks connected with the app by early November. After graduating from LSU with a degree in mass communication, Gugenberger spent roughly six years in Washington, D.C., working in politics. While there, she and her husband enjoyed its massive food truck scene. With food delivery apps springing up left and right, Gugenberger noticed a gap in apps specifically catered to food trucks. When she and her husband Walter, a software developer, moved to New Orleans to be closer to her family, they saw the opportunity even more. They conducted polls and market research, interviewing both consumers and food truck owners, to solve the problems other apps were having. They learned that high commission rates caused food trucks to suffer, especially considering that the tips would often go to the driver transporting the food rather than to the food truck employees. NOMAD charges about a third of what other food delivery apps are charging, Gugenberger says. The proximity and size of Baton Rouge’s food truck scene makes it the perfect next step for NOMAD. Several Baton Rouge food trucks have expressed interest in using the app, she says. After that, founders will move onto other Louisiana cities: Lafayette, Lake Charles, Shreveport and Monroe. “We really want to make sure we get as many folks in Louisiana signed up as possible,” Gugenberger says. In 2019, they plan to launch in Texas and other states. New features are also in store. In the meantime, NOMAD is hosting a food truck festival at Champions Square in New Orleans Nov. 2. Attendees will be able to order food via the app from New Orleans food trucks like Frencheeze, Diva Dawg and South in Ya Mouth. Baton Rouge funkadelic band Phat Hat will also be performing.